Are you a minimalist parent when it comes to your baby gear? 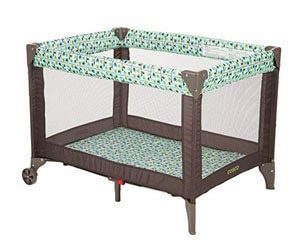 There cannot be a better option for you than buying one of our best baby playpens or pack ’n play’s recommended below. 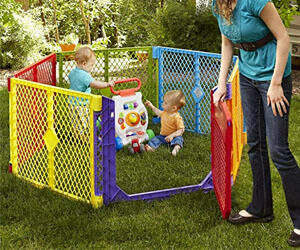 These handy baby playpens can be taken out during travelling and can be easily carried through doorways and small openings. Baby playpens provide a toddler with a safe play area free of falling hazards and choking hazards, décor items, unstable furniture, electrical outlets and all the other household items with which a baby could harm himself/herself. While picking the best playpen for newborn, think about the area where you will set it up. If you are going to set it up in your home then and you are not worried about its size or weight, then a baby playpen with long panels might be an ideal choice. When you are looking for a playpen you could bring regularly to play dates, a friend’s or relative’s residence, or a daycare center, a compact folding playpen which doesn’t have many pieces, is an excellent pick. If you’re seeking a playpen that could be used in the outdoor arena, please bear in mind the durability and firmness of its materials considering the fact that there can be other kids besides yours who might play in that playpen. If you select a playpen which is too small for babies to play and enjoy, the sole purpose of you buying such a product will remain unaccomplished. Or, if you buy one which cannot be moved easily due to its weight and structure, it would result in more frustration than convenience. How can you use a baby playpen in different ways? One of our best playpen for toddlers can be used for naps if you don’t want to share your bedroom during naptime; additionally, this can be a great idea to get your baby accustomed to sleeping somewhere other than their mother’s lap. Though change is always difficult, especially for babies, but, by making them accustomed to our best playpen for toddlers, your life would become much easier once they get used to sleeping peacefully in their playpen. For instance, if you’re going to work and have to drop your baby princess at a daycare center, the mental peace you’d have knowing the fact that your baby would be able to sleep peacefully would not only make you happy, but also more productive at work. Also, babies can enjoy their independent playtime. You can take it to the beach for a picnic or for a camping trip because a playpen genuinely serves well when it is about taking care of a baby who is not yet walking. 1. Why do I need a playpen for my baby? 2. How much does a good durable playpen cost? 3. What features to look for in a playpen? Fisher-Price Ultra-Lite Day & Night Play Yard carries almost half of the weight of the other playpens for toddlers with all the excellent features. It comprises of everything a parent looks for, to provide their baby with a most comfortable and safe space. A toddler can nap and play all night in this consolatory, removable and portable inclined sleeper. Its supportive seat, padded head support and constraints on three-points keep baby secure, comfortable and nicely inclined; additionally, the head-support and cushion are machine-washable. If you remove the sleeper, this big playpen for babies is a cozy area with lots of space for the baby to relax and play in. The softened mattress can fit into any crib sheet. The inbuilt storage pocket grips the portable clutch which is a brilliant feature for changing diapers quickly and easily, and you can open it with one hand. This playpen can be an excellent choice to provide your baby a fantastic start in life and help parents to help their kids grow safely from infants to babies to preschoolers in their own way. Chicco Lullaby Baby Playard provides all the necessary baby-care requisites for babies including a practical care station and comfortable environment; making it a perfect playpen for toddlers. This playpen follows baby’s growing stages by offering multiple configurations for sleeping, napping, playing and resting. Babies love cuddling into the soft infant napper for the beginning days of their lives before moving to a cozy raised bassinet and finally transitioning to the capacious playard. Since it consists of an enormous changing table, which is quite easy to install and provides a spacious area for changing diapers, this playpen offers a parent organizer, large enough to store a bundle of diapers, wipes, and creams available closely at all times. In case of those “particular accidents,” you can always zip-off the mattress cover and wash it immediately. The features mentioned above help you keep the playard well organized and clean. This baby playard has an independent nursery center which stores in a hand-carry bag to pack and carry it for travel, making it the best travel playard. 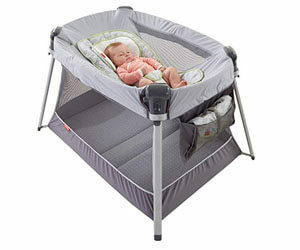 On top of that, its single piece bassinet makes it very convenient to install at any place. This playpen can be a great option if you’re looking for something that helps you with taking care of the baby as he grows up. If you’re looking for an inexpensive and always ready to go playpen, Summer Infant Pop N’ Play Portable Playard is a great option. It provides massive space for more than one baby, and its mesh sides allow for necessary air flow as well as the visibility you need for keeping an eye on your baby. 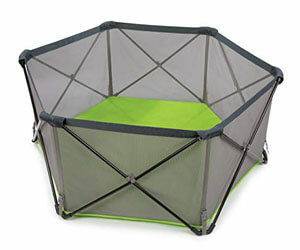 The best part about this playard is that it works great even in outdoor spaces. Its water-resistant base keeps the surface dry, making it the best outdoor playpen for your baby and you can also purchase a canopy that blocks 98% of the UV rays to provide extra protection to your baby. Since this playpen isn’t very expensive, buying a canopy with it won’t cost you much. 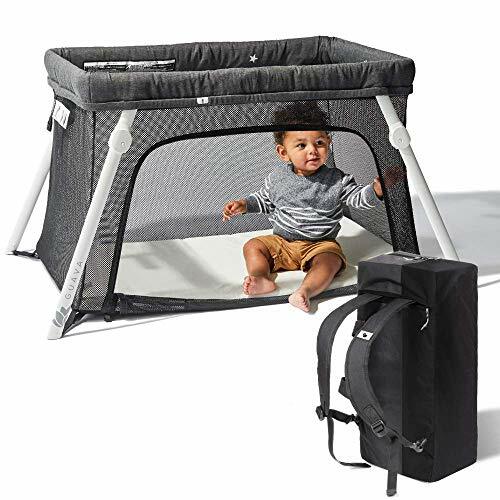 This playpen is very easy to install/uninstall due to its ultra-lightweight which is definitely going to leave you delighted especially on the day when you have a bunch of other stuff to carry around. You can consider it as one of the biggest playpens for babies which works great in large spaces, but it is hard to set up in small areas. If you’re a mom of more than one and you spend most of your time away, Summer Infant Pop N’ Play Portable Playard is the product for you. 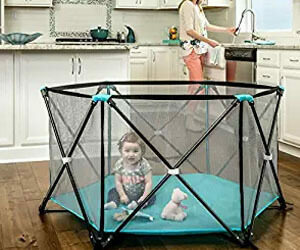 This extra tall playpen for toddlers is a safe option if you fear that your baby is big enough to climb over side walls and it even stops your pets from jumping over. It works equally well for indoor and outdoor spaces. Its brightly colored walls make this playard attractive for your baby. The Folding ABC Play Mat, which is sold separately, provides a comfortable sleeping and playing time for your baby. This Ultimate 6-panel Playard, which consists of a safety gate, is easy to install or fold due to its interlocking, pre-connected panels that require you to click them in place without needing to use any tools. Its non-slip and skid-resistant pads prevent the playard from scratching flooring surfaces such as hardwood floors. The convenient carry strap allows you to carry this playard around. The Regalo My Play Portable Playard is suitable for everyday use with plenty of room for your baby to play or move around in the playpen. The simple yet sturdy design of this playard allows you to set it up or fold it down instantly and its lightweight, foldable and water-resistant design makes it ideal for indoor/outdoor spaces as well as easy to carry around. 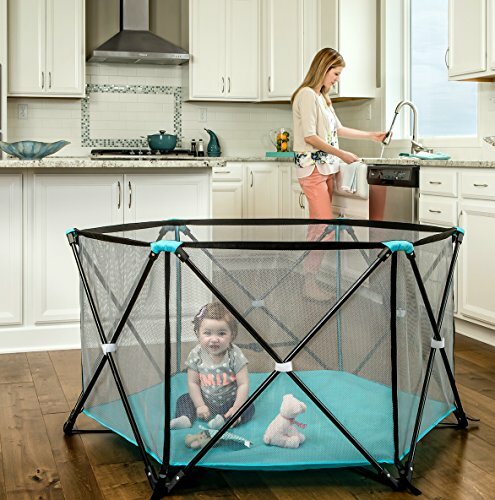 This playpen guarantees a safe space for your baby to play or sleep in since it meets the standards set by the American Society for Testing and Materials, and Juvenile Products Manufacturers Association. You can fit it in a carry bag when traveling, and it works perfectly in both indoor and outdoor spaces. The soft ventilating mesh walls, which provide excellent visibility and the nylon bottom, are easy to clean up using a wipe or even a damp cloth soaked in a hand wash or soap to keep the surface fresh and germ-free. 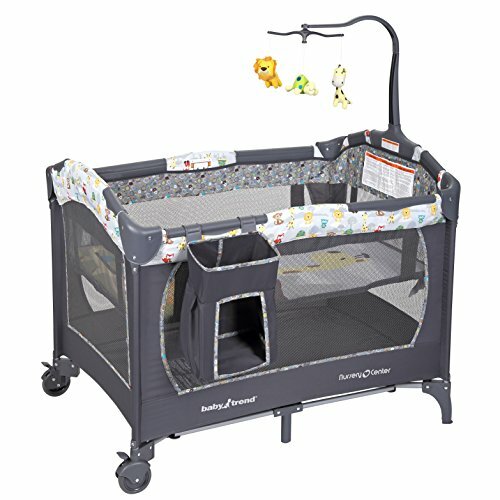 It won’t be wrong to call this one of the best playpen for toddlers with a double locking feature that provides extra safety for the baby. Chicco Lullaby Baby Playard is an all in one playpen, suitable for babies transitioning from infants to toddlers, comprising of a newborn napper, bassinet, playard and a changing station. It’s all in one feature supports almost all the activities of a baby and making it the best choice baby playpen. The infant napper provides a cozy and cuddly kind of environment for the baby during his naptime and can be folded for storage purposes. The deluxe quilted mattress of the bassinet can be instantly installed as soon as it is needed and can be folded for storage. The extra-large playard has plenty of room for the baby to move around or play. The Chicco Lullaby Baby Playard comes with a sizeable detachable changer with an easy-clean surface that lets you change your baby’s diaper quickly, and the parent organizer helps you keep all the essentials, such as diapers and wipes, around safely. All these features that are mentioned above indeed make this the best playpen for babies, infants, and toddlers. This playpen also consists of a removable toy bar that lets you attach soft, stuffed toys to it to entertain the baby. 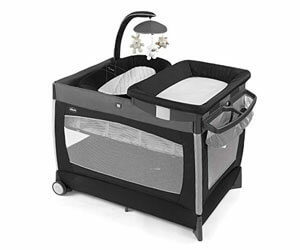 You can move around the playpen from room to room on the wheels, or you can use the convenient push button to compactly fold the playard and carry it in a bag while traveling. It’s zip and wash mattress lets you clean the mattress in case of an accident. Its sleek design perfectly goes with your home furnishing and décor. 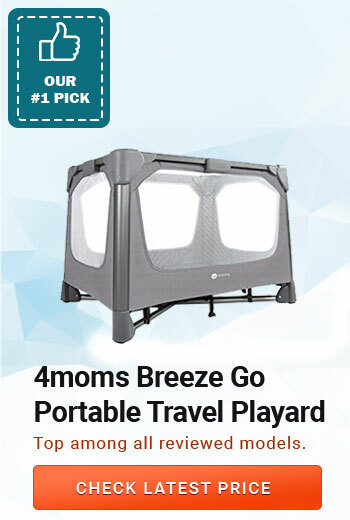 4moms Breeze Go Portable Travel Playard is extremely easy to use – push down on the central hub to open it up and pull it up to close, its latches are not complicated and work automatically. This playard is designed for on-the-go purpose which makes it easy to carry, travel and set up at any place. It comes with a carry bag which makes it easier to move around while traveling. Its waterproof playard sheet and diaper station is sold separately. Baby Trend Deluxe Nursery Center is a comfortable playard which has it all – removable bassinet and canopy, flip away changing table, one-hand locking technique, toy storage pocket, wheels with brakes, travel bag, electronic music center with volume control, nightlight, and two styles of music. The removable canopy provides shade as well as entertainment through the toys that are attached to it. Diaper changing is supported entirely by the flip away changing table and the diaper organizer. Before traveling, you quickly fold the playard following some easy steps; fit it into the travel bag, and it is ready to go. The large caster wheels allow you to move the playard around easily and their brakes provide all the safety that is needed. Disney Baby Minnie Mouse Sweet Wonder Play Yard is one of the best playpens for babies if you’re looking for something exciting yet comfortable and handy. 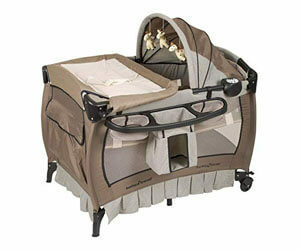 This playpen comes with a deluxe organizer which offers to keep all the essentials of the baby within reach. 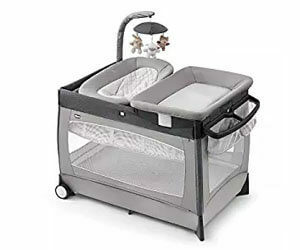 The newborn bassinet is spacious, and it consists of breathable mesh with good visibility that allows you to keep an eye on your baby from anywhere in the room. Cute and amusing stuffed toys hang on the detachable toy bar to entertain your little one. The changing station consists of a wipeable pad which is easy to clean. The two wheels attached to the bottom of the playard offer great room to room mobility. The carry bag that comes with this playard helps you carry it around conveniently when you’re traveling. Cosco Funsport Playard provides a hugely amusing and child-friendly space for your little one with open-view breathable mesh sides with excellent visibility so you get to keep an eye on your baby and he doesn’t feel isolated as well. This playard offers plenty of room for your baby to play around. Setting up or folding down this playard takes less than a minute which is easy and straightforward. Two wheels support it at the bottom that helps significantly with room to room mobility. The carry bag helps you to pack and carry around the playard when you’re on the move. Cosco has been known for its dedication toward providing safe and user-friendly products; it meets ASTM safety standards and is JPMA – certified. Playpens are not a requirement but they surely help you get stuff done, other than just taking care of your baby. You can travel with playpens and use them as a safe space for your baby to spend time in while you work. Playpens are mobile which helps greatly because you can move them around from room to room as required. Nothing good comes easy. There some playpens available whose durability depends on their cost. Still a number of playpens provide good features and excellent durability at a very reasonable price. You’ll need to go through their features and then decide which playpen would work for you the best. A changing station that helps greatly when the baby needs a quick change on the fly. A bassinet for your baby to sleep in. A storing pocket that lets you keep all the essentials of your baby in a reachable space. 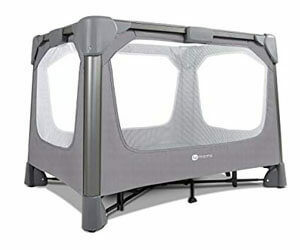 These and many other features that fulfill your requirements are what make our playpen the best choice when it comes to ease, comfort, and security for your baby. As a parent, you can never be too careful while choosing the best playpen for newborn baby. 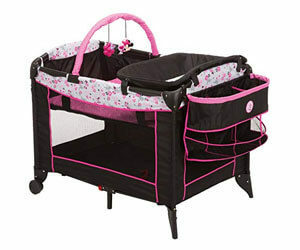 There are so many things that you have to consider before you opt for the right playpen for your little bundle of joy. Safety of your child is of prime importance. Preventing your child from tripping over the material used, climbing over the playpen walls or stopping him from oral interaction with the material of the playpen is important and requires a great deal of inspection. Playpens with higher walls that have good visibility and consist of child-friendly material are a good option. Secondly, all other factors like portability, the number of functions that are provided, water-proofing, the weight of the product, compatibility with indoor/outdoor spaces, etc. are of certain importance as well. You can decide which product is best for you based on your preferences since everyone has a different lifestyle and they value different things. To conclude the baby playpen review, you have a large number of options to choose from and reviewing the above-mentioned guide will help you make up your mind about things that you consider of great importance, and they will later help you choose the best baby playpen.